Life goes on as they say. 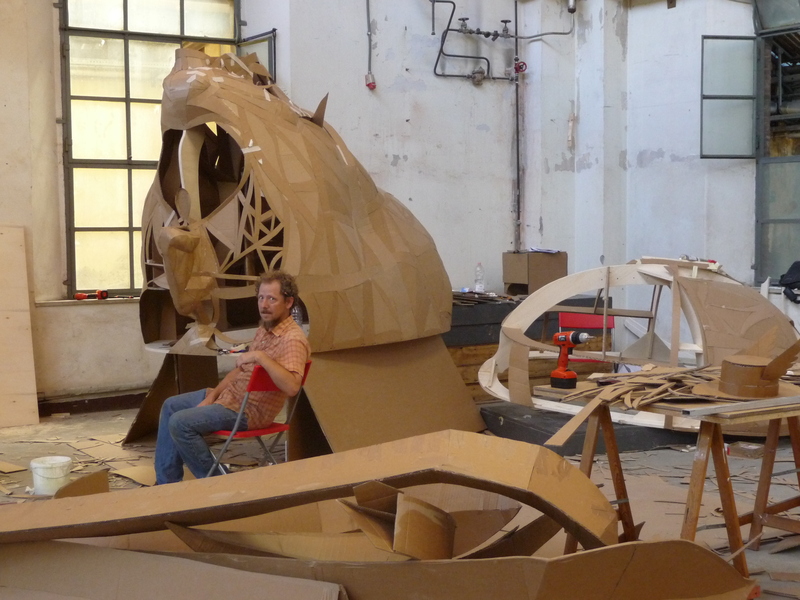 The last time I posted I was going to Italy to work on a monumental scale cardboard sculpture. Which I did. 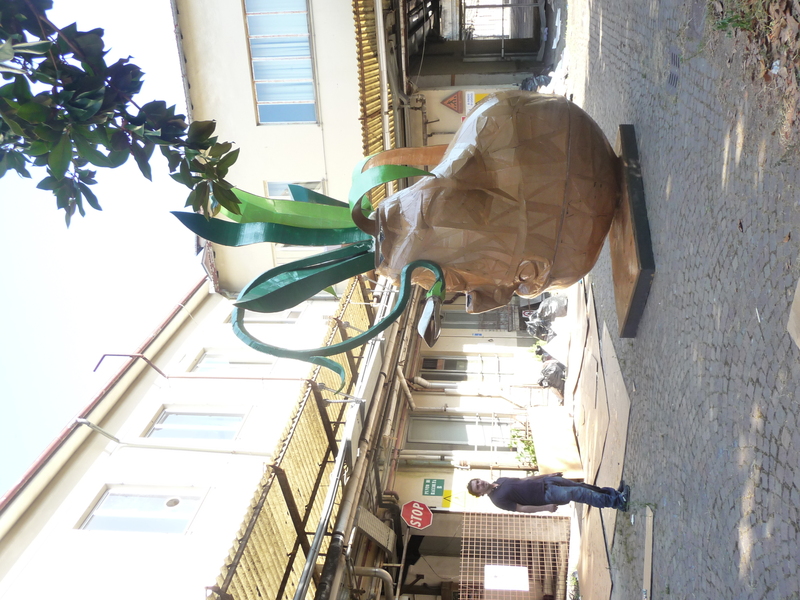 Shortly after after the completion of that piece, while I was still in Lucca my brother died tragically. My brother, Owen, suffered from severe mental illness, Schizoaffective disorder, often abbreviated as SAD. A mental disorder characterized by abnormal thought processes and deregulated emotions. The diagnosis is made when the person has features of both schizophrenia and a mood disorder, in my brother's case Bi-polar. Needless to say it was quite a blow and unfortunately I began to associate the project at the Lucca Biennial with my brothers death. The piece titled, We All Fall to Earth, was a meditation on mortality and as the god of irony would have it my Brother passed on the day it was finished. Though I have been keeping very busy I have also withdrawn from the online world to some degree. I am engaged with social media much less, but I've kept up to date on Instagram. Which I find less intrusive into my mental space than say Facebook. I would just rather work on art than manage endless online accounts. This website being the most neglected. I'm considering a revamp on this site to maybe integrate some social media feeds into the content or possibly simplify down to a bare bones portfolio. 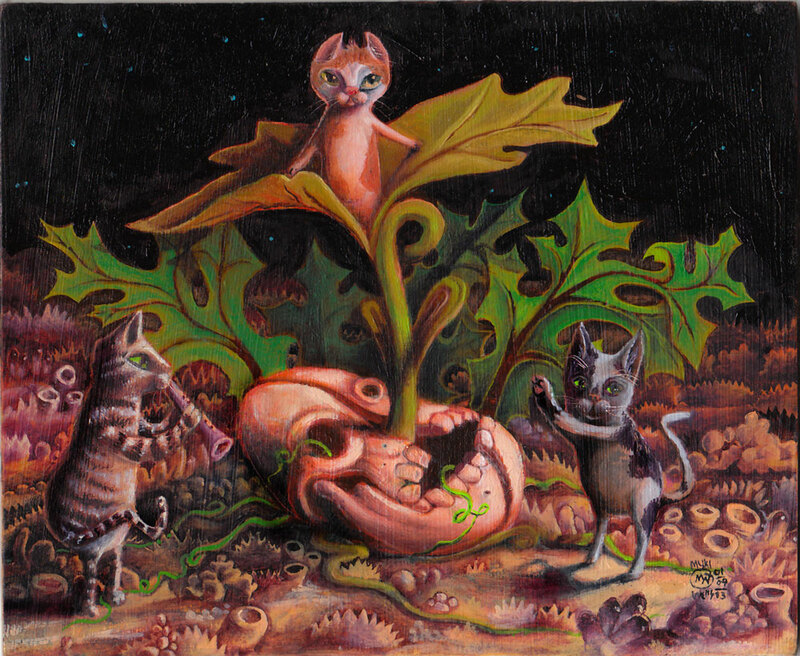 I'm also considering working on the blogging aspect more because I have been teaching classical oil painting and I'd like to engage my students in a dialog. It's all a bit much and I haven't thought it through yet. If you are interested in my work and happen to arrive here and see nothing new know I will be updating this site on a more regular basis. Fresh content shall be forthcoming. For now the best place to look for me is Instagram @myklwells. You may have attended one of my free community workshops, sat with me on a public art committee Or danced your booty off at my event, The Cardboard Ball. I love making art, I love creativity, I love inspiring others! It's what get's me up in the morning and keeps me up a little too late at night. I also love my community and I do a lot to make it more creative, playful and fun. Things Like: Free community workshops, artist development workshops, public art panels and events like Cardboard Ball and All Souls Procession. It's not just a competition it's also a month long residency where you work along side other artists to realize your creative vision. Followed by a Month long exposition. 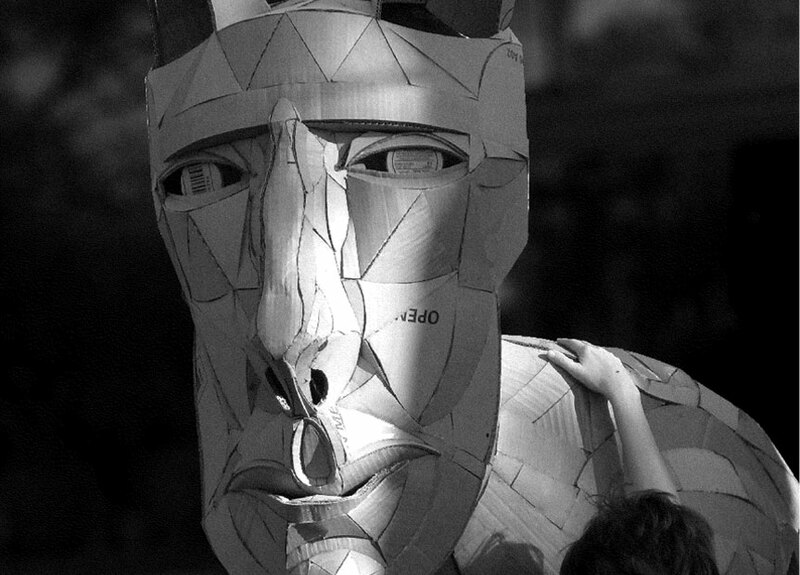 In 2012 I built an 18 foot tall sculpture, Buccanale. It was a great experience, I made some great friends, got to experience Italy on a very personal level. Best of all I won the grand prize for my work. It was an incredible honor and I couldn't of done it without the support of my community. This year I am excited to announce, I've been invited back, not to compete, but as a special guest artist. 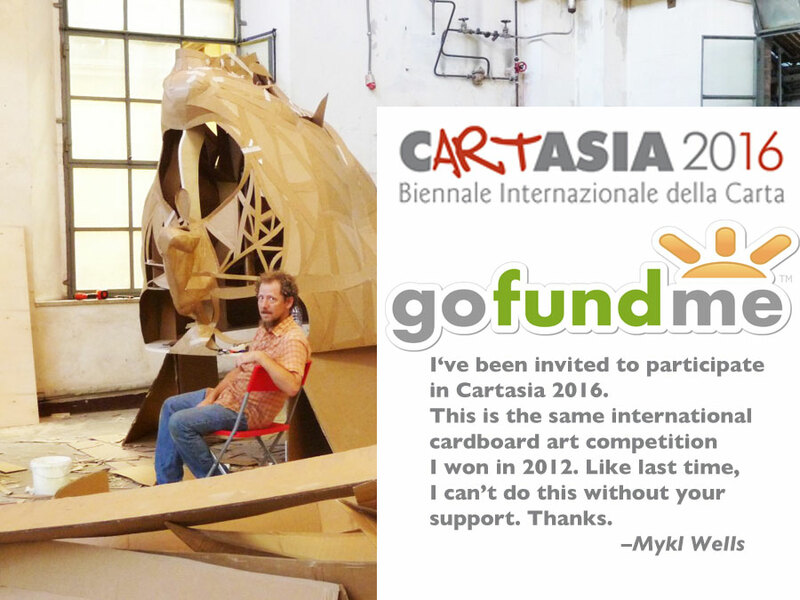 Though Cartasia will fly me out, put me up, give me a studio space and all the cardboard and glue I want. They can't pay me. That's not much. So I've started this Gofundme campaign, I've set the goal at $3000 to cover the gofundme fees, help me along in Italy, you never know when you might need to run to the hardware store, and for any unforeseen expenses. I'd hate to leave my partner holding the bag if an unexpected Vet bill came up. Please give what you can and help spread the word, share the link on social media, tell friends, family and co-workers. Anybody you think might be interested. It won't take many small donations to arrive at this modest goal. Like last time I'll keep a running journal on Facebook, my website (myklwells.com) and maybe twitter & instagram if my Ludite brain can figure them out. 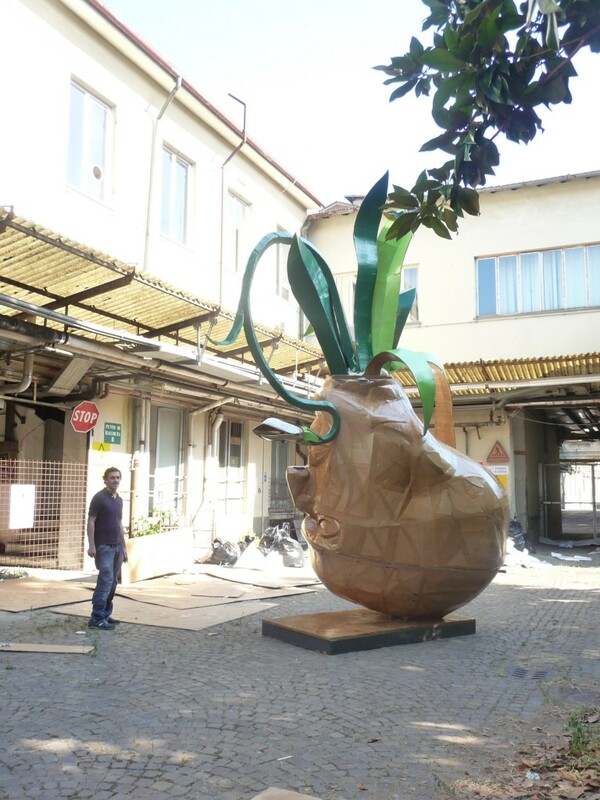 Every two years the Cartasia selection committee decides on a theme for the exhibition, in 2012 the theme was, Crisis and Rebirth, My sculpture Buccanale was based on the idea of a flower bulb, which has to freeze before it can bloom. This year the Theme is, Borders and Boundaries, And I am developing an exciting project, tentatively entitled: Invaders! 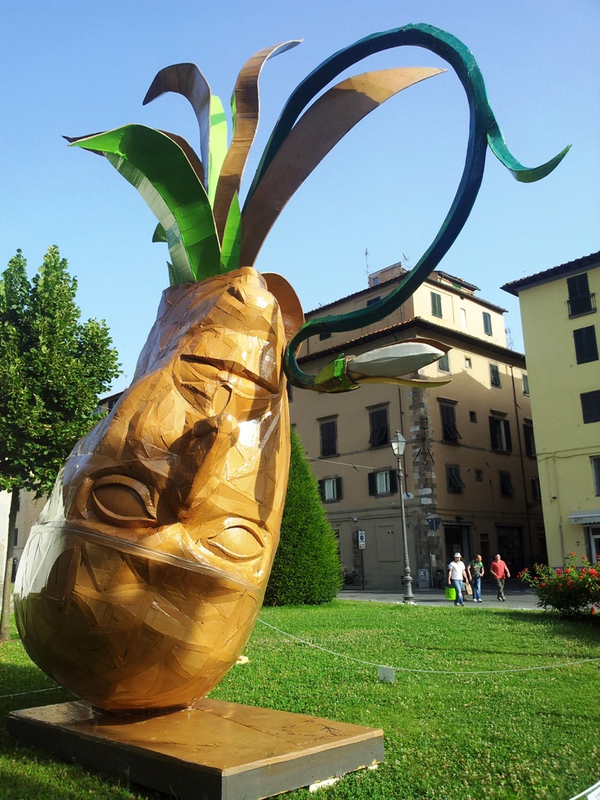 The Idea is that a spaceship has crashed in Lucca and a couple of Aliens now find themselves in a strange new land. 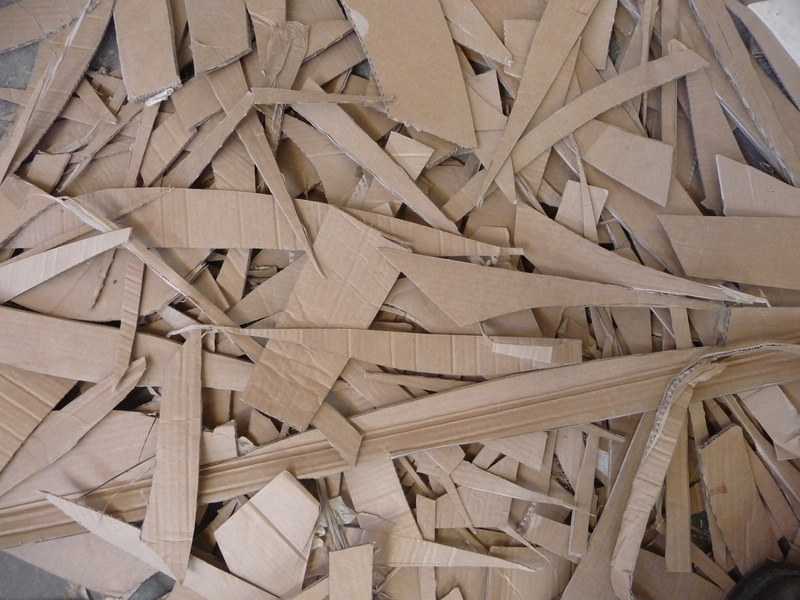 The first part is to create a Monumental cardboard sculpture of the Crash Site. 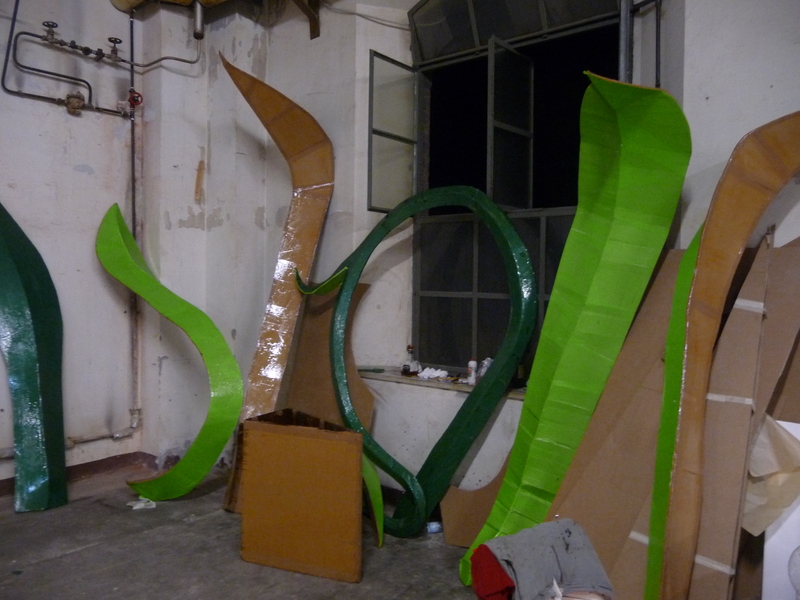 The second part is that I am collaborating with performers in Italy who will become the cardboard clad aliens, wandering the city. I need your help to pull it off. I'm deeply grateful to live in a community that supports these wacky forays in to the creative world. Let me be something of an ambassador of our creative playful culture, it's gonna be FUN! 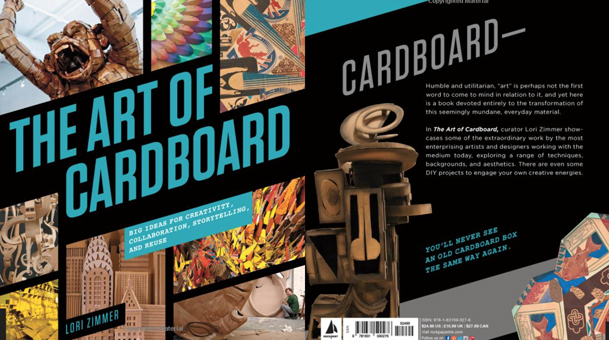 I'm pleased to announce that I have a chapter in this important new book, The Art Of Cardboard, by Lori Zimmer of ArtNerd NY fame. It also includes such luminaries as Wayne White, Beauty is Embarrassing, and Anne Webber one of the pioneers of using cardboard as a fine arts medium. Plus way more artists and a whole section on projects, to introduce you to creating with cardboard. It's a great book and it's totally affordable. 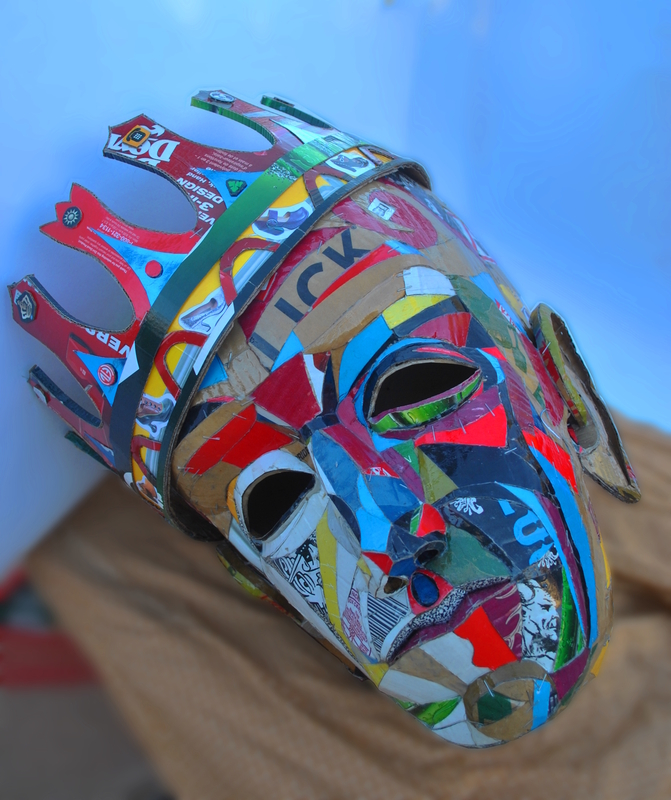 Here's an Amazon Link: http://www.amazon.com/The-Art-Cardboard-Collaboration-Storytelling/dp/1631590278 Check it out! 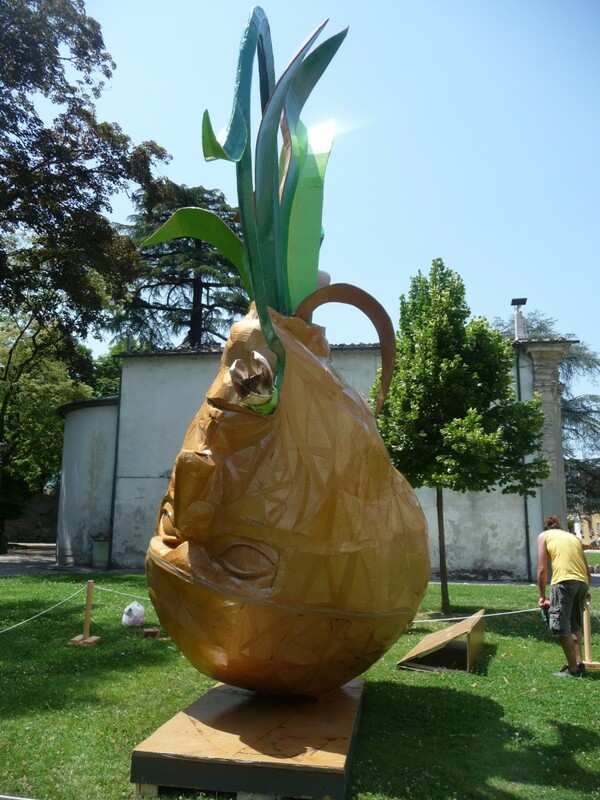 Traditionally held at the end of September the Cardboard Ball is recognized as the trademark Mykl Wells art event. Now is the time to start getting creative! 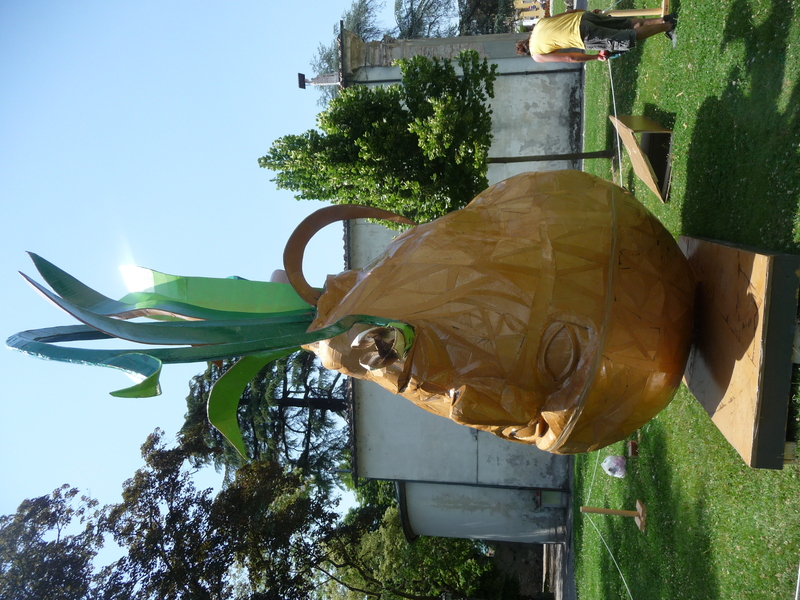 The Cardboard Ball is a fun showcase for your cardboard and recycled art, fashion and culture. Have a crazy idea that you think will fit in with the theme of the Cardboard Ball, share it! That's how the cardboard Joust became an integral part of the Cardboard Ball. 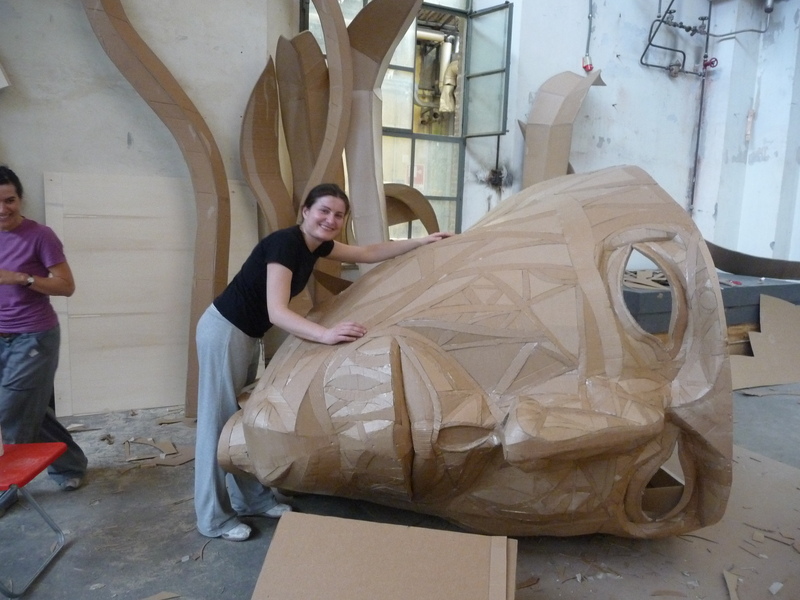 Want to make a gigantic cardboard sculpture? That's just what Jana McConnel did when she made the eight-foot tall Moositar and Mermaid. And lets not forget the incredible out-pouring of creative effort in the form of costumes and fashion, it's what makes the ball roll. This year we're planning on once again having the photobooth on hand to document your creative efforts, and expanded cardboard joust and lots of incredible music so you can dance the night away. Keep your eyes peeled for dates and location, coming soon! Saturday and Sunday, April 18 & 19, 2015 from 11:00 am until 5:00 pm Come an join me for a day of fun in my studio. 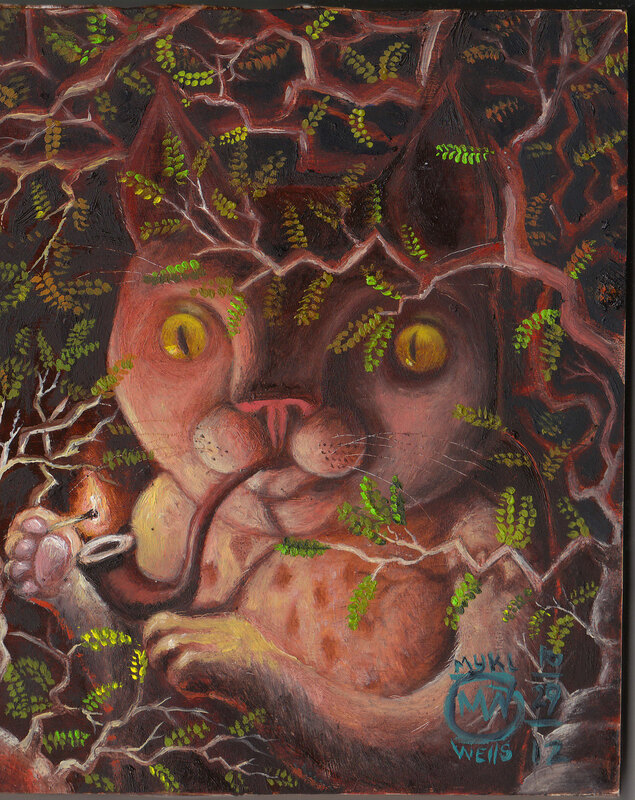 I will have a few works for sale and be available to answer what questions I can. I'll have some cool beverages to drink and Waffles until the batter runs out. 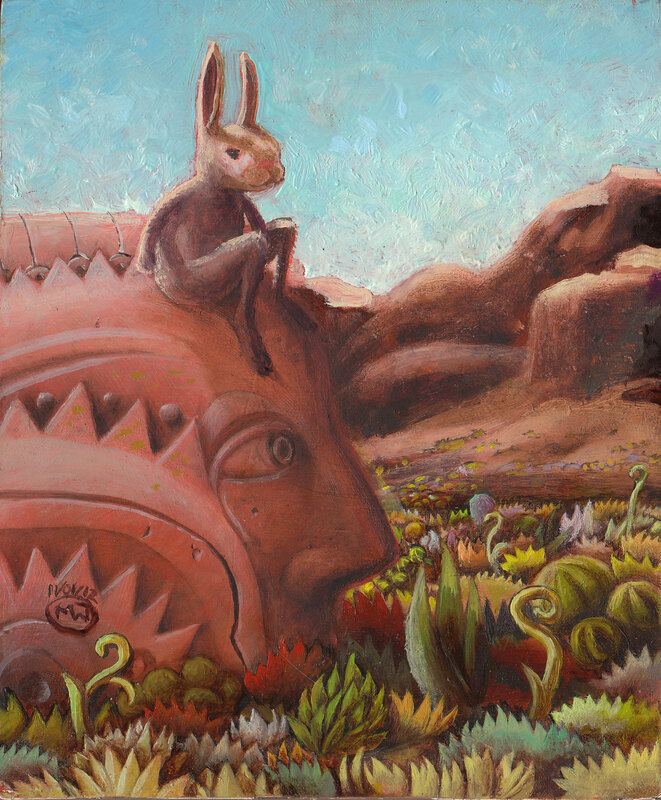 http://www.tucsonopenstudios.com/ All the details and more. Look for my Listing in Zocalo See you there! Foundry and casting workshop registration closed. 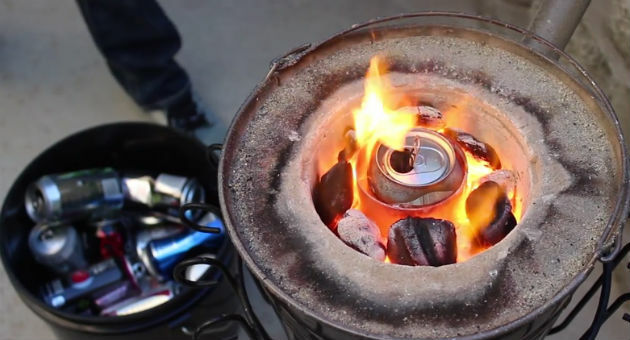 Learn to build and use a simple charcoal fired foundry to cast aluminum. Sunday March 22nd 11AM-3PM Sunday March 29th 11AM-3PM To learn more and sign up click here. 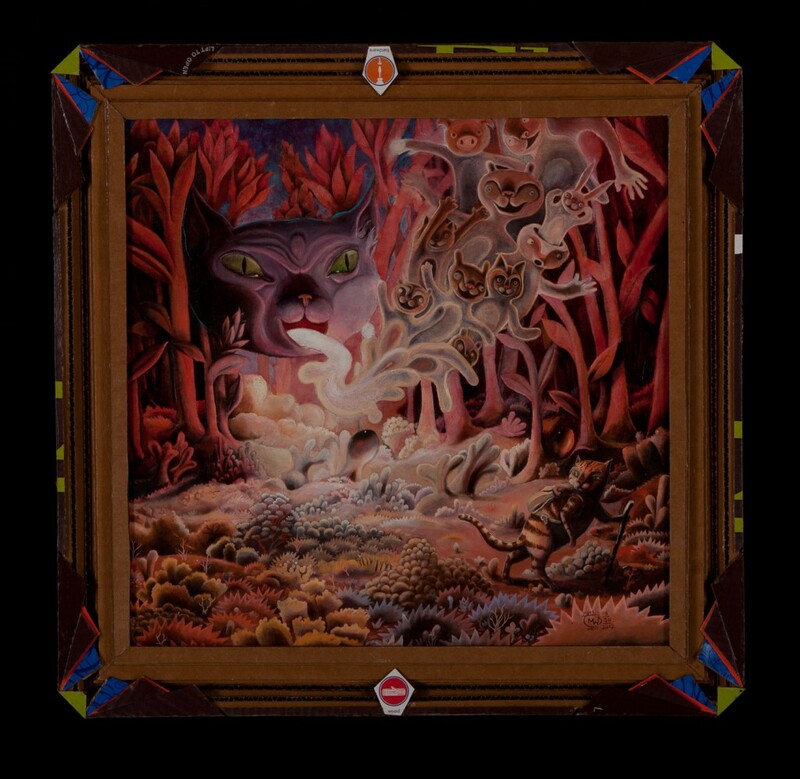 Title: Shadow of the Prancemancer Medium: Oil on Panel Date: 10/31/2014 Dimensions: Description: The classic battle of good vs evil. 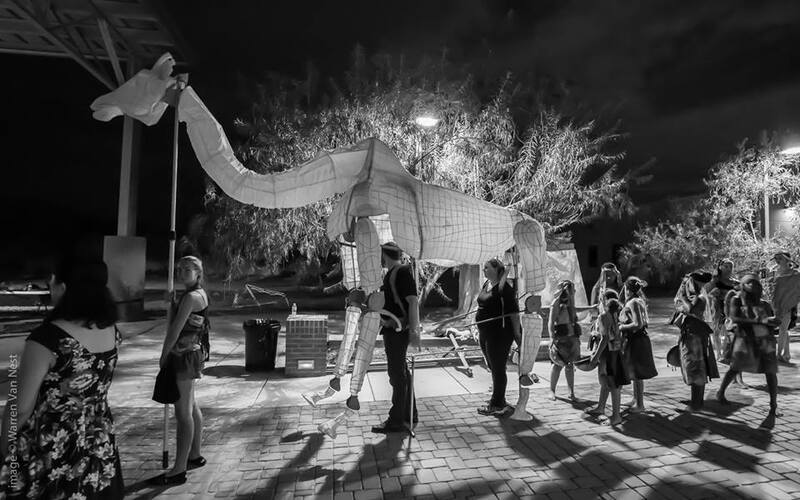 2014 Commissioned by the Tucson Chinese Cultural Center for a performance, Zheng He in the Desert. Puppet stood a full 14 feet tall and weighed in at about 60lbs. Muslin skin stretched over a wire frame with widen articulated joints. 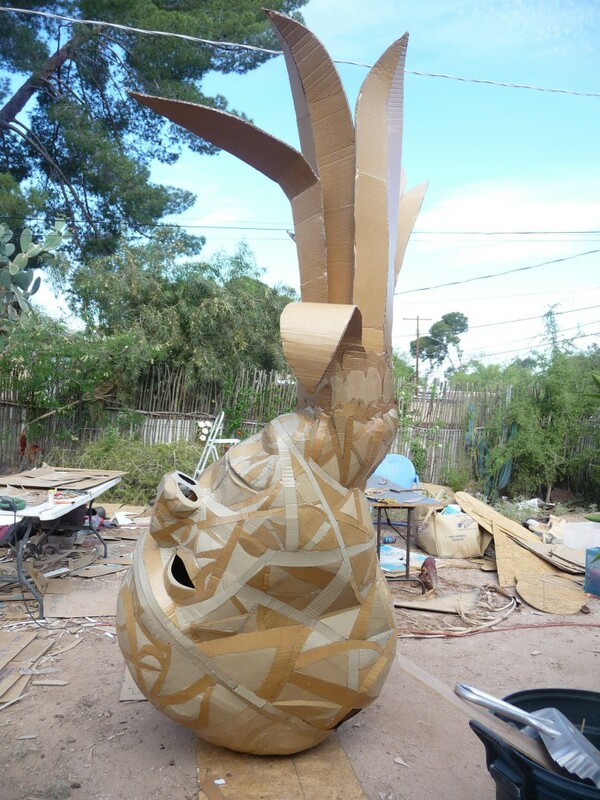 Tucson Sculpture Festival 2014, Hosted by Bicas. 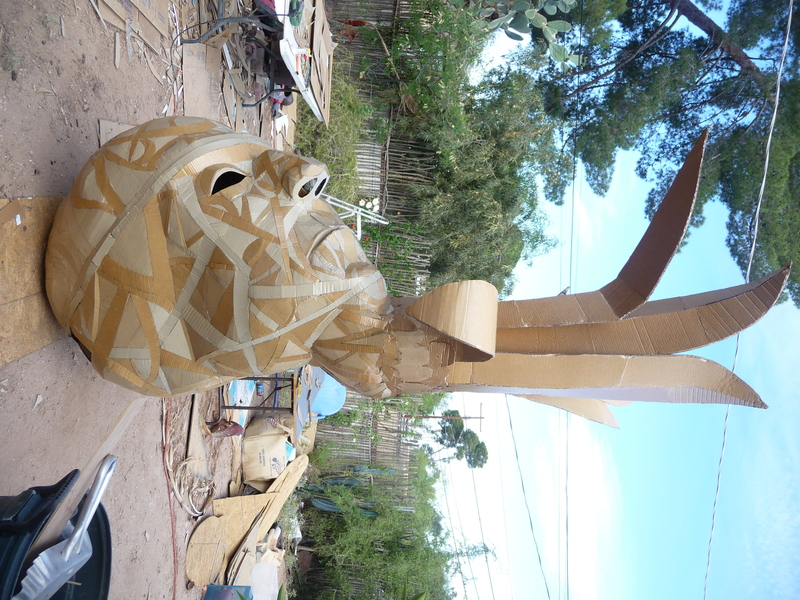 A new cardboard sculpture to premier at The Tucson Sculpture Festival. 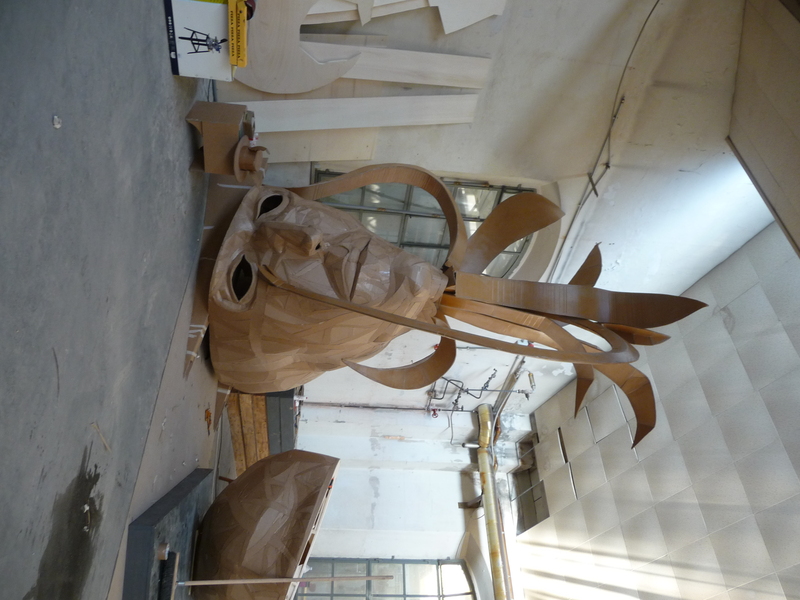 Prince des Sots, made of cardboard, glue, staples and polyurethane, about the size of a Galapagos tortoise. This piece is a departure for me as I am leaving the raw cardboard look I have enjoyed in the past and am beginning to exploit the colorful printing and advertising found on boxes. Pertinent info can be found below the photo and a link to the facebook event is provided at the bottom of the post. Survived another season of All Souls Procession Workshops. Just a brief note to thank those of you who joined me at the Free Community Workshops in Support of the All Souls Procession. From the little paper mâché masks to the giant riderless motorcycle, it was for me a wonderful adventure and I'm happy I got to share my love of the creative spirit with you. I will probably be doing it again next year. Looking forward to a little down time. ALL SOULS PROCESSION WORKSHOPS now in session! Every weekend in October myself and many wonderful and talented local artists will be running the All Souls Procession Free Community Workshops. It's a place where we have space,talent and materials to help you achieve your creative vision for the All Souls Procession. 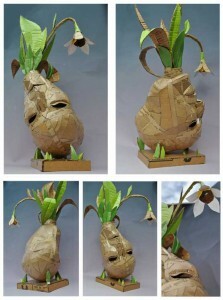 Want to make a mask, lantern, big-head puppet, or shrine. You can do that. Have a grand vision of a float, a marching band of the dead, a mobile temple? We can do that too! Get your self down the the workshops and help us help you to make the most of this incredible unique rich cultural experience. When: Every weekend in October Both Saturday and Sunday 11AM-5PM with special week night workshops announced on our facebook page adhoc. Where: Steinfeld Warehouse 101 W. Sixth Street Tucson AZ. What: Bring yourself and any kind of art, craft or building materials you might have Donations happily accepted! How: We will help you! Now get your bad self down and get your Procession ON! 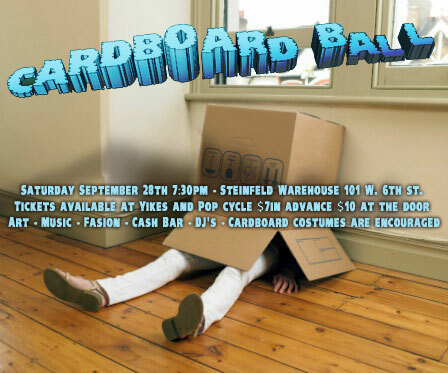 The Cardboard Ball is a participatory art party, cardboard fueled super dance destroyer. Once a year local artists and the general public are invited to make art and fashions out of cardboard (or any recycled repurposed material) and come together in celebration and support of the creative spirit. All proceeds from the Cardboard Ball pay for the All Souls Procession Workshops. A free workshop series, open to the public that runs through October. Advanced Tickets Go on Sale September 7th at Yikes Toys in Broadway Village, Pop Cycle on Fourth Ave. and Borderlands Brewery on Toole Ave.DJ's and Live Music provide the sonic backdrop. Food trucks will be serving up some deliciousness and what better to go with that than a cold dark malty brew made specifically for the Cardboard Ball By Tucson's own Borderlands Brewery. Perhaps wine is more to your tastes, which we have courtesy of Tucson's Premier Beer bar, Tap & Bottle. A photobooth will be on hand to document your evening. And Art lots of Art! 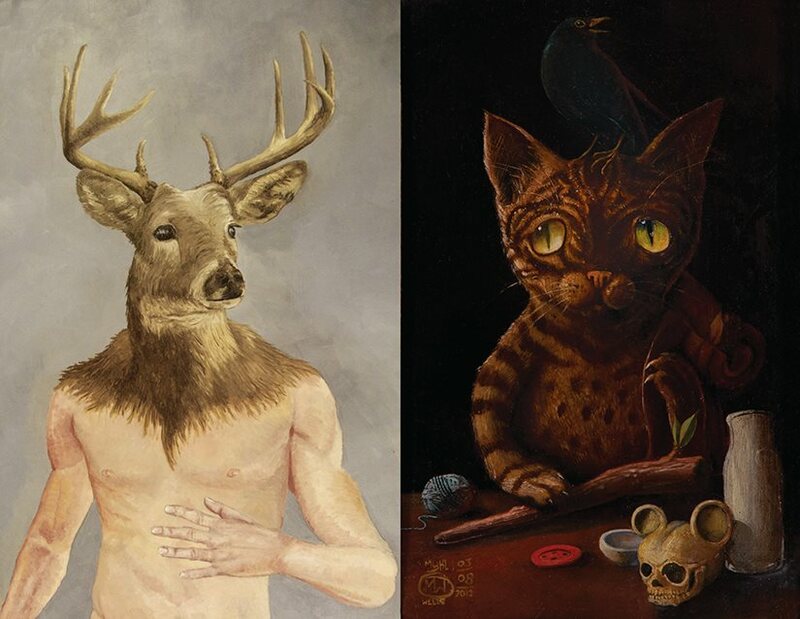 Over thirty artists are creating 2D and 3D works. Attendees are encouraged to dress up in their own cardboard creations,SO GET CREATIVE! If you are an Artist, Maker, Creative, or Lunatic and you want to make a piece for the Cardboard Ball, it's open to everyone who wants to participate. Please inform me info@myklwells.com that you would like to be part of the fun. 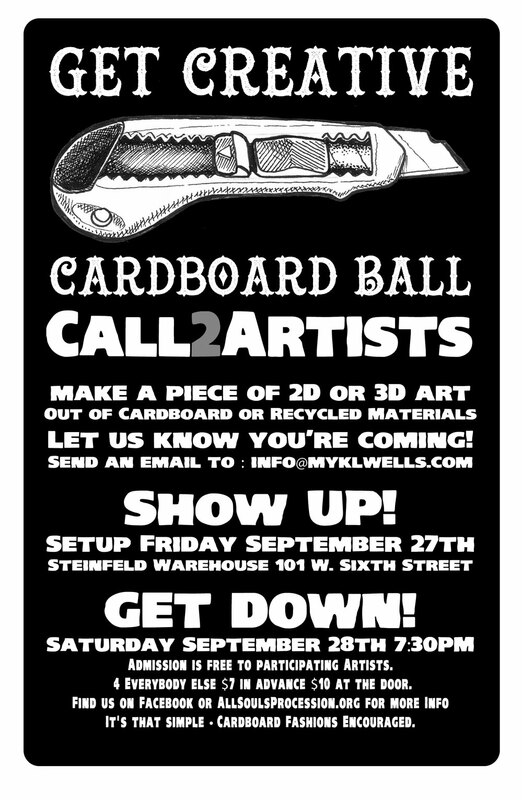 Call o Artists is open until September 27th when your cardboard creations have to be dropped off at the Steinfeld Warehouse, 101 W. Sixth Street. Drop off is noon to seven PM. Participating artists get free admission, though we encourage making a donation since it is a fundraiser. FIND US ON FACEBOOK All Souls Procession Workshops Page: https://www.facebook.com/AllSoulsWorkshops Cardboard Ball Event Page: https://www.facebook.com/events/338904652908263/ Cardboard Ball Call2Artists Event Page: https://www.facebook.com/events/499981093417479/ Get ready, set GO! Cardboard Ball Black & White Flyer download and print it out, help spread the word! Download a PDF of the 2013 Cardboard Ball Flyer, Help Spread the Word!!! So What am I up to you ask? Well organizing, making exciting new paintings cutting up boxes and making my poor wife crazy. Oh and I've got a fundraiser coming up, Cardboard Ball 2. This year it's funding the All Souls Procession Workshops that I run, I hope. So please come on down and join in the fun. Tourists are welcome but this is a participatory art party, like much of what I do, we are trying to create a culture where creativity can flourish, where everybody gets to contribute in their own unique way. 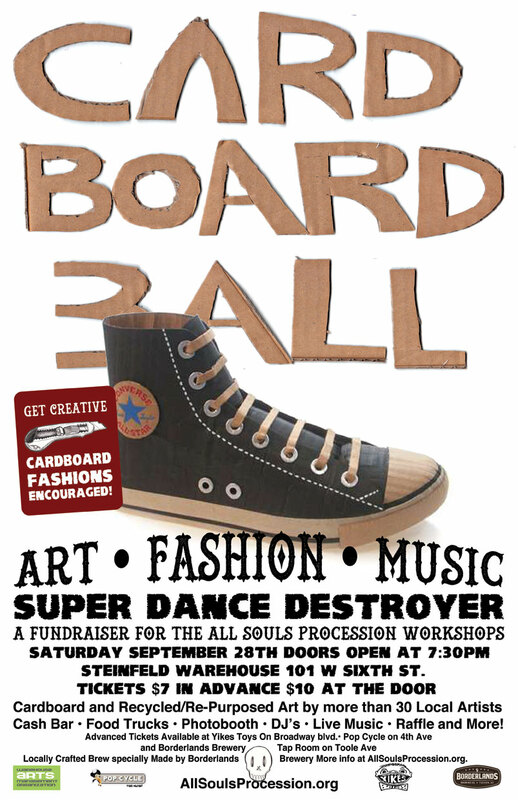 Here's what I can tell you about the event The Cardboard Ball is a one night only art exhibition, grooving dance party and the premier fundraiser for the All Souls Procession Free Community Workshops. 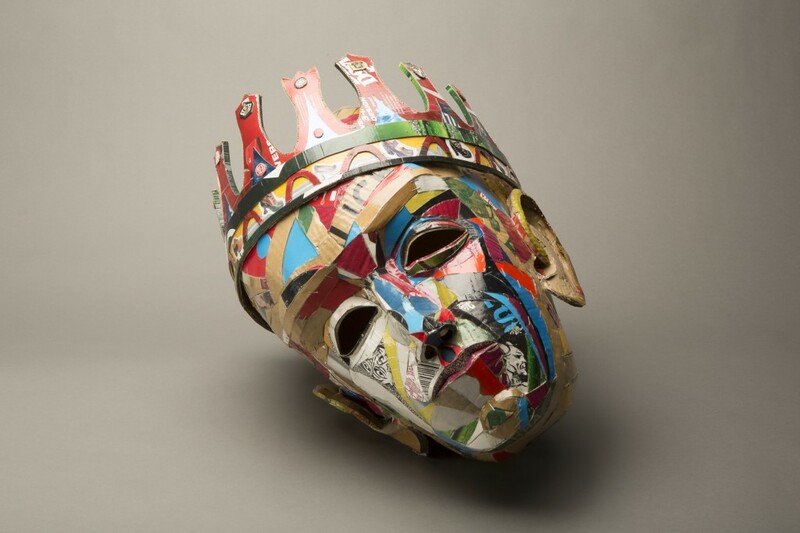 The event features cardboard art on display, created by talented local artists and craftspeople. 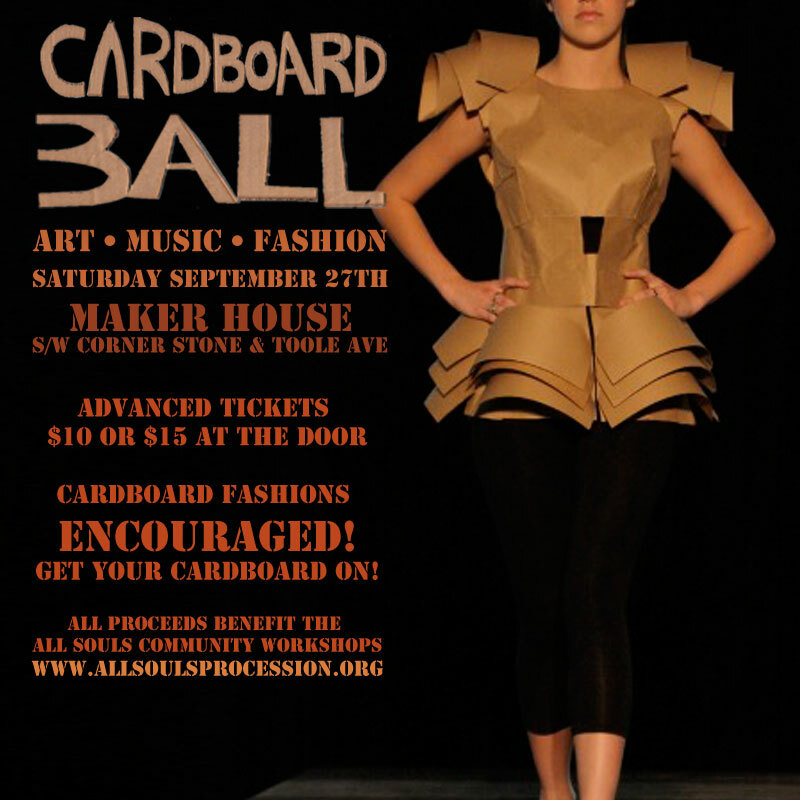 Ball attendees are encouraged to create cardboard outfits and wearable art. Last year, attendees were treated to some truly breathtaking cardboard costumes and installations and this year promises to be even grander. This year’s event is on Saturday, September 28, 2013 at the Steinfeld Warehouse 101 W. Sixth Street. Doors open at 7:30pm. Tickets* are $7 in advance and $10 at the door. 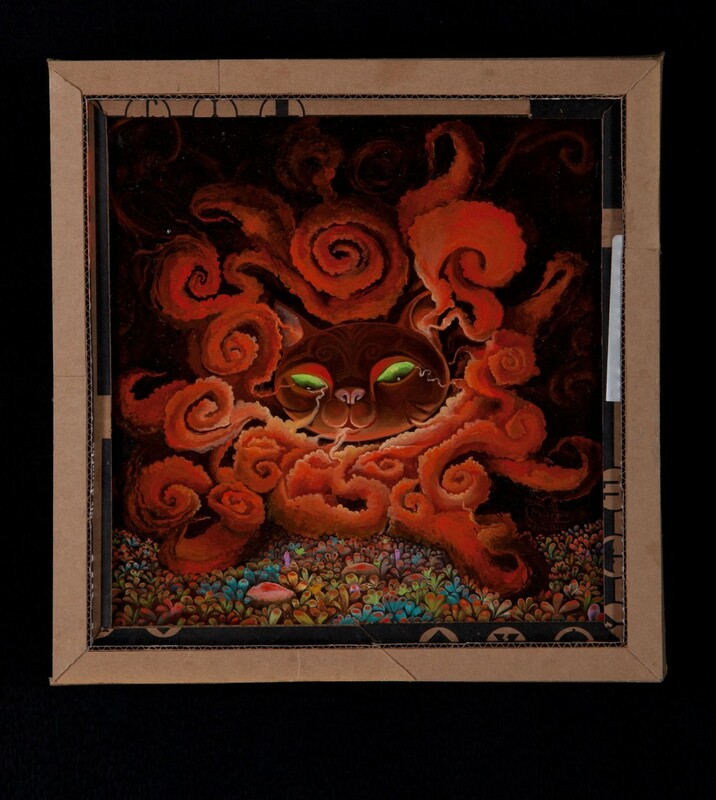 All proceeds benefit the All Souls Procession Workshops. The call to artists is on going, right up to the event. 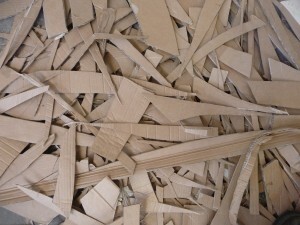 If you are an artist and interested in creating a work made out of cardboard and other recycled/repurposed material, please consider contributing a piece. This is not a juried event or competition. All submissions will be shown providing there is room. 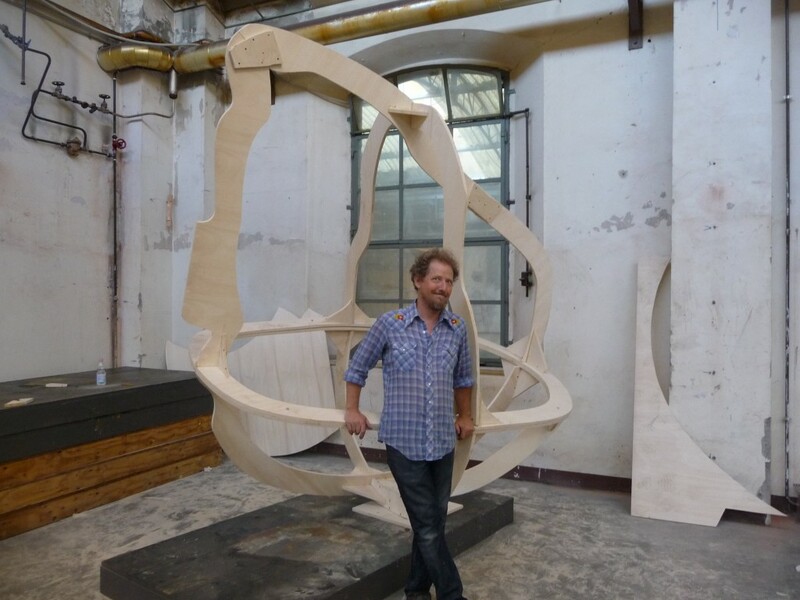 Three-dimensional work is preferred and submissions can be standing sculptures, hanging suspended sculptures, or items to be hung on the wall. IMPORTANT: Because existing lighting is limited, it is recommended that your work include its own illumination. You are encouraged to sell your work. A percentage of the selling price goes to support the All Souls Procession Workshops. etup for the artists is Friday, September 27th. You do not need to submit work before the setup day, however space is limited, so you do need to sign up in advance to contribute work. Please contact Mykl Wells at info@myklwells.com include a way and time to contact you! *Tickets are free for participating artists and those who wear a costume or outfit made of cardboard, however because this is a fundraiser, donations from the artists and costumed attendees are deeply appreciated because they help us cover the cost of the All Souls Procession Workshops. I'm working on several projects for the Ball. I'm trying to set up a photobooth, for so people can self document. I plan to make these photos available online through Snap fish or similar so people can order hard copies. We have a DJ or maybe two. I've got an application for a temporary permit to sell beer and wine at the event. I have a sound system. A couple of food truck will be outside serving up some yummy goodness. There will be a merchandise table for MMOS There is a possibility that one of the local breweries will be making a special beer for the event. We are going to also have an art raffle, tickets will be a dollar or two and you can select which piece of art you want to be in the raffle for. We will be printing a few posters/flyers and some postcards I'm finalizing the design in the next couple of days. Pop Cycle on 4th Ave, and Yikes toys on Broadway will sell advanced tickets starting at the end of August. I have an interview at the beginning of September and we are trying to get on KXCI for an on air interview right before the event. So that should give you an idea of what we are up to. __________________________________________ Schedule The The Cardboard Ball and Workshop Schedule Friday the 27th of September, Art/drop off and install. Tables set up and ready. Sound system. 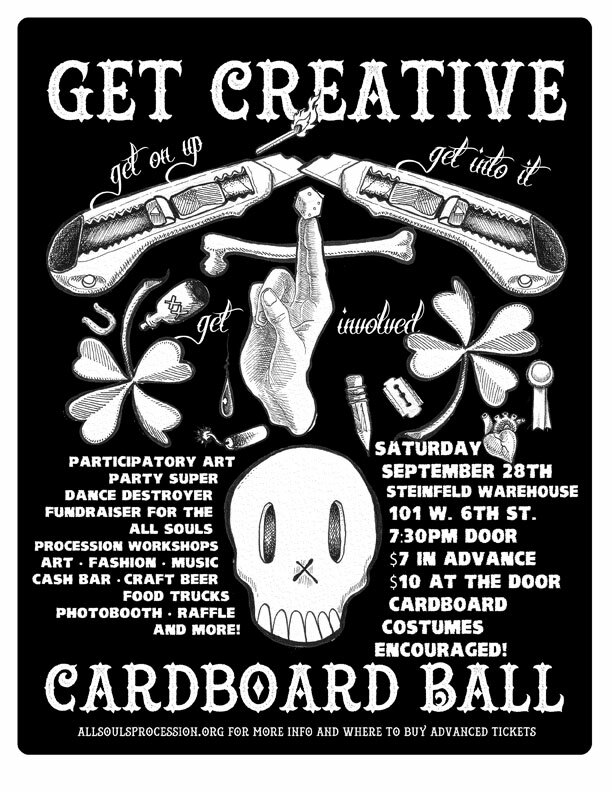 Saturday the 28th, the cardboard ball, doors open at 7:00 Sunday, 29th, Clean up and prep for workshops the following weekend. Artists may pick up their work if they wish. AND LETS NOT FORGET WHAT THIS IS ALL ABOUT! 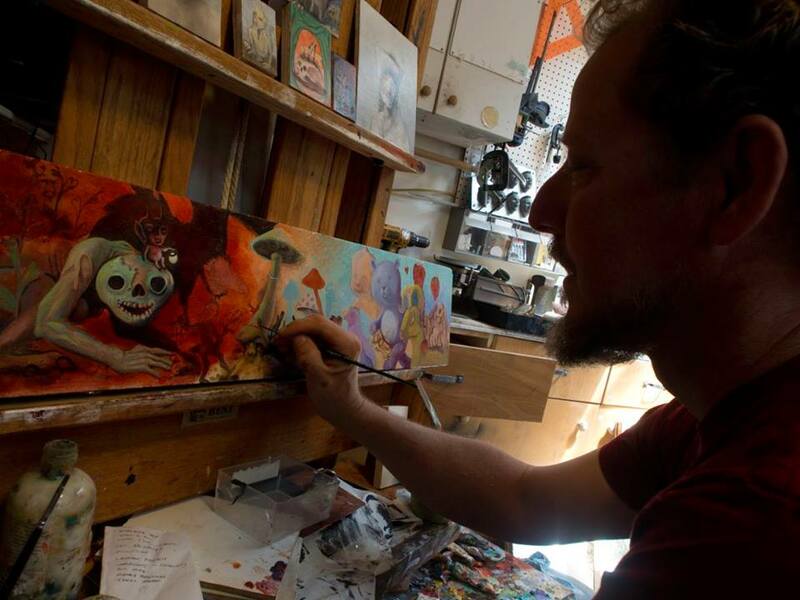 All Souls Procession Free Community Workshops run Saturday and Sunday 11AM-5PM each day. Thru October, 5th & 6th, 12th & 13th,19th & 20th, and the 26th & 27th. With special Cart Clinics announced during the course of the workshop. These will be held midweek evenings. 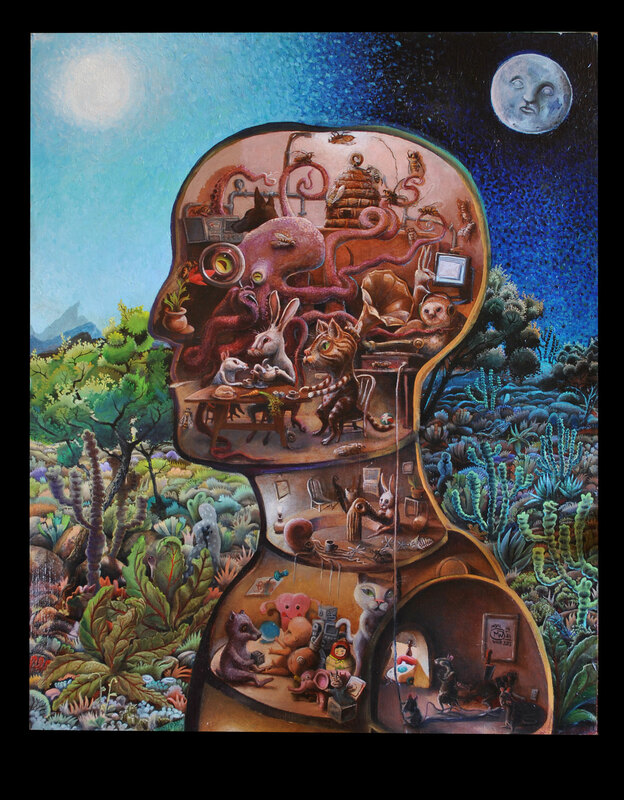 Title: A Thin Veneer of Consciousness Medium: Oil on Panel Date: 06/20/2013 Dimensions: 18″ X 24″ Description: Exploring the idea that consciousness is an illusion. All Souls with an interview of yours truly. 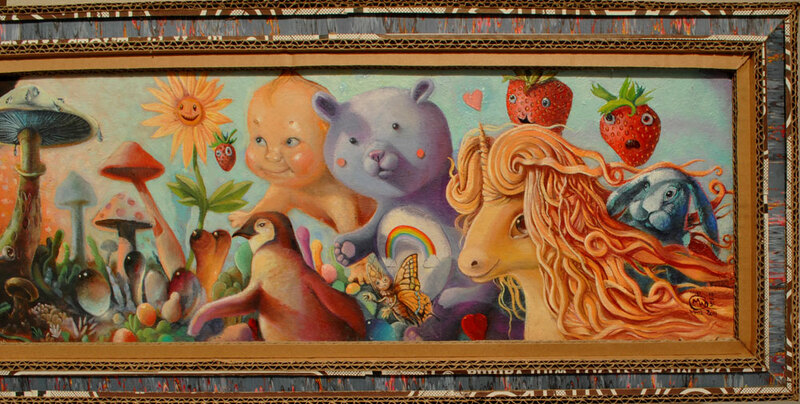 Tucson Open Studio Tour Spring 2013 this weekend April 13th and 14th. This weekend stop by and visit durring the Tucson Open Studio Tour. Saturday and Sunday from 11AM-5PM. Located 1 block north of Grant and 2 and-a-half blocks east of Campbell: 2115 E. Spring street. Come in the front gate and slip along the side of the house to the backyard studio. MAPS and INFO about the City Wide Tour are available in this April's Zocalo Magazine and at tucsonopenstudios.com Look for a big sculpture out front. Would love for you to stop by and hang out for a spell. 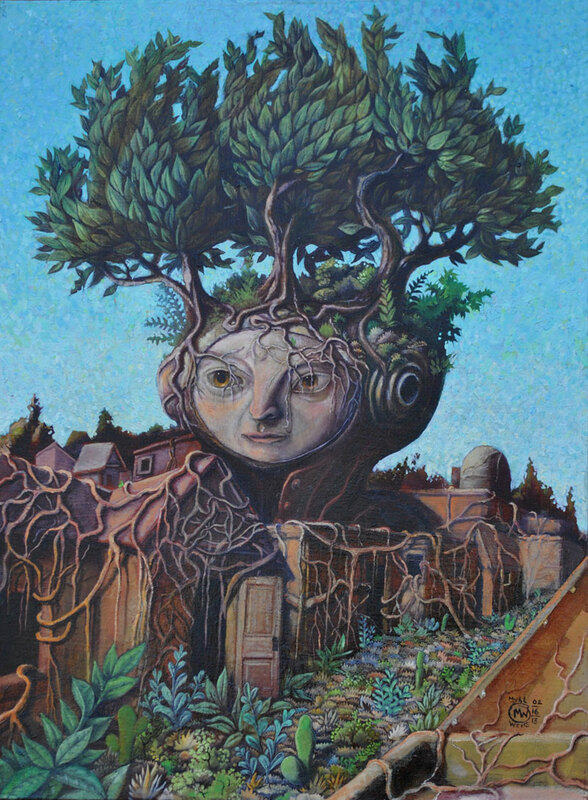 Title: Roots Run Deep Medium: Oil on Panel Date: 02/16/2013 Dimensions: 16″ X 14″ Description: A place is shaped by us as much as it shapes us. Say hello to my new dog Izzy. 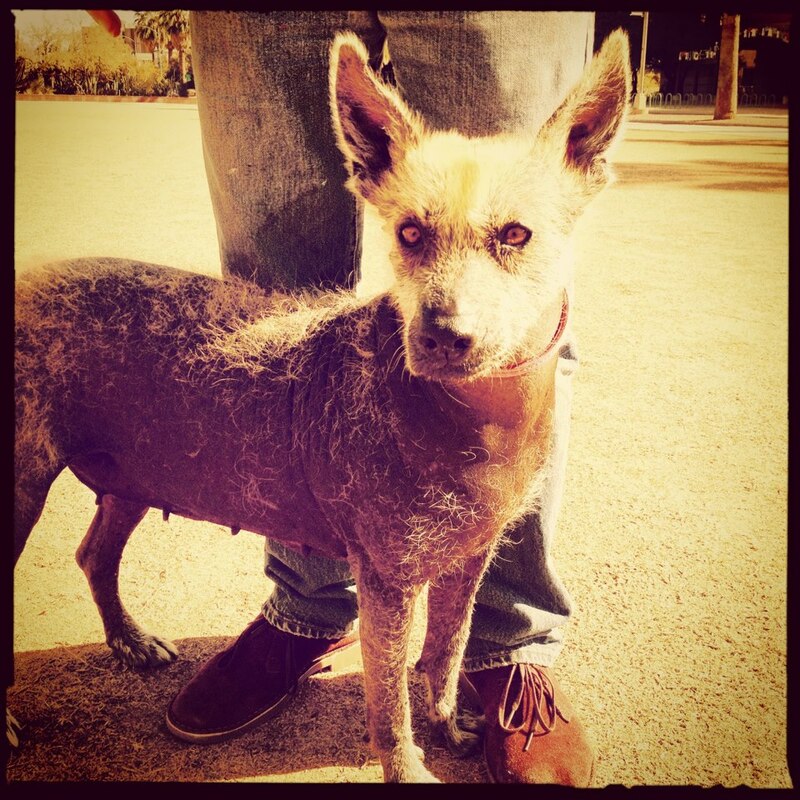 She's about six and is half Mexican Hairless (Xoloitzcuintli) though I'm not sure which half. She's one of the gentlest creatures I've ever had the pleasure of hanging out with. Likes to hang out in the studio while I paint. I have kept Xolos for almost twenty years, I love them. She was at the Humane Society about to be euthanized, just couldn't let that happen. The more I know people the more I like dogs. Title: Emoticon 1. Medium: Oil on Panel Date: 11/01/2012 Dimensions: 5" X 6" Description: On the contextual planes the iconic emoticon monument crumbles, long forgotten. Title: Emoticon 2. 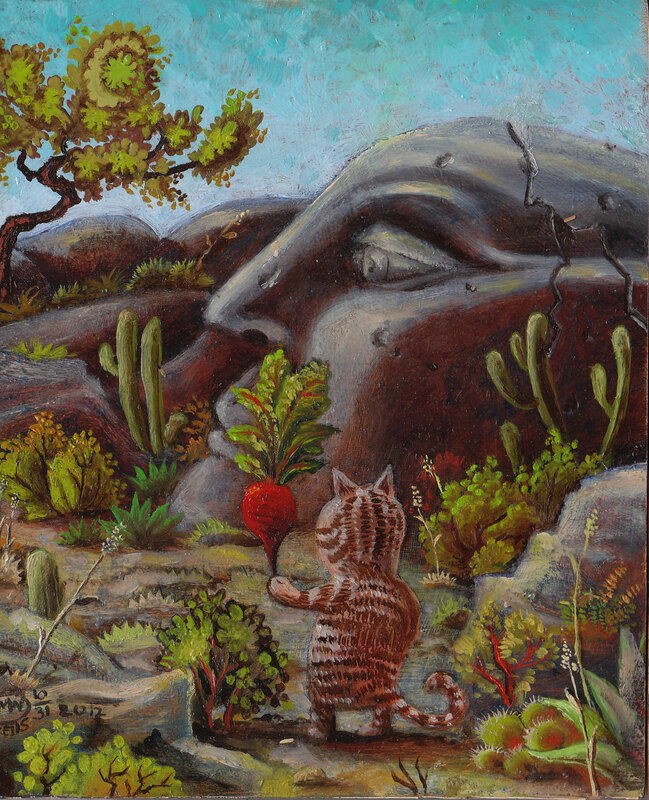 Medium: Oil on Panel Date: 10/31/2012 Dimensions: 5” X 6" Description: In the desert of Scuzi an offering is made to a forgotten civilization. Title: Meerschaum. 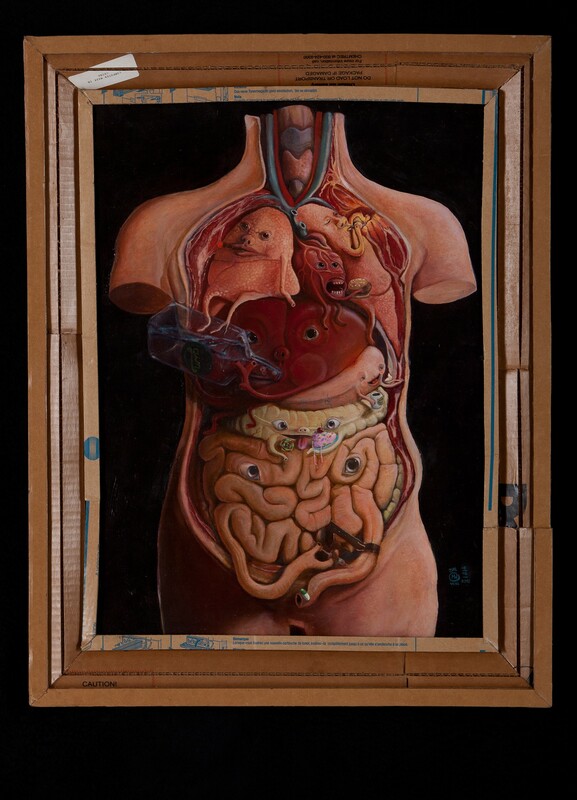 Medium: Oil on Panel Date: 10/29/2012 Dimensions: 5” X 6” Description: Stuff that in your pipe and smoke it. Title: Filtered Results. 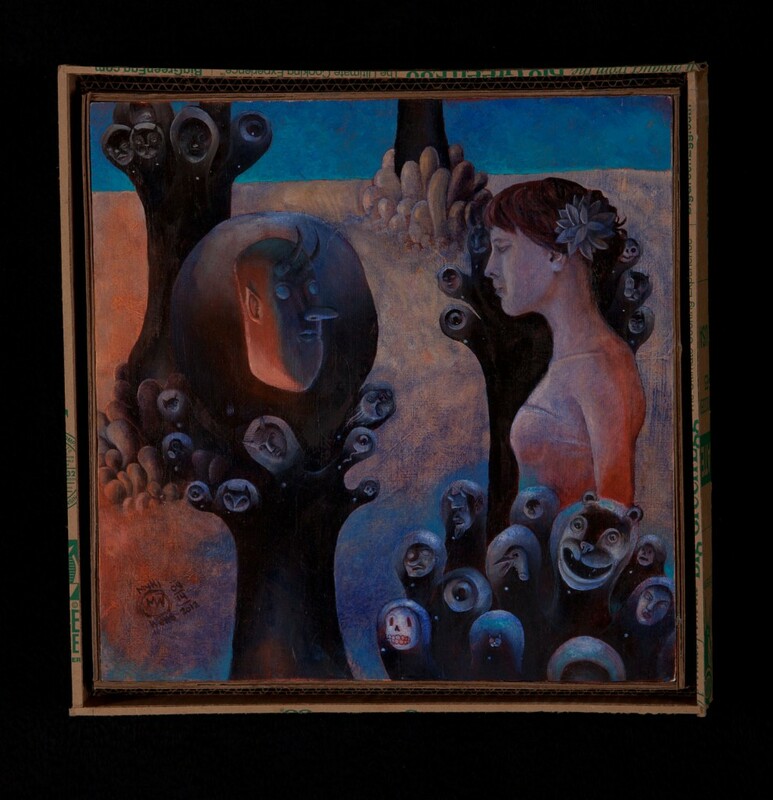 Medium: Oil on Panel Date: 09/14/2012 Dimensions: 14" X 14" Description: Did the Oracles of Delphi filter their responses, did they present you Ads before they looked into your future? Title: Big Appetites. 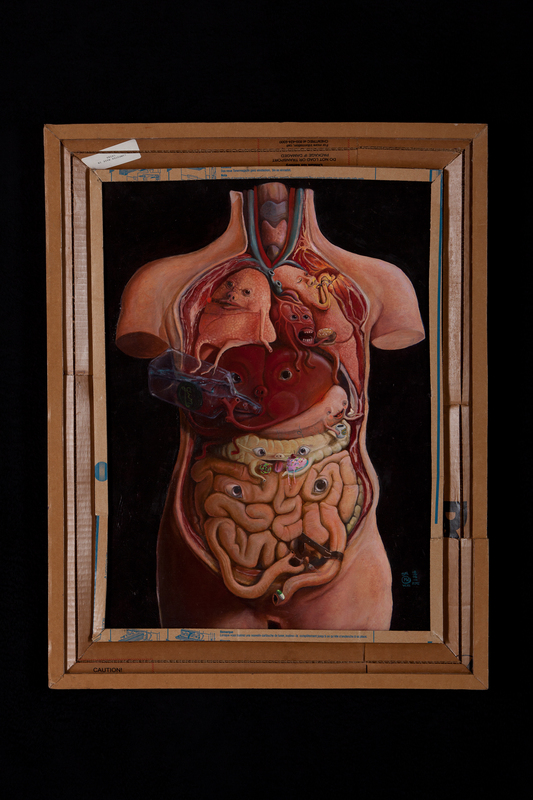 Medium: Oil on Panel Date: 08/05/2012 Dimensions: 17.5” X 24 Description: While in Italy this summer I spent considerable hours looking at very old beautiful wax anatomical models and I was inspired to paint this when I returned. I have a number of vices and somehow they combined with the wax and were extruded through my creative gland. Or that's was my physician's prognosis. 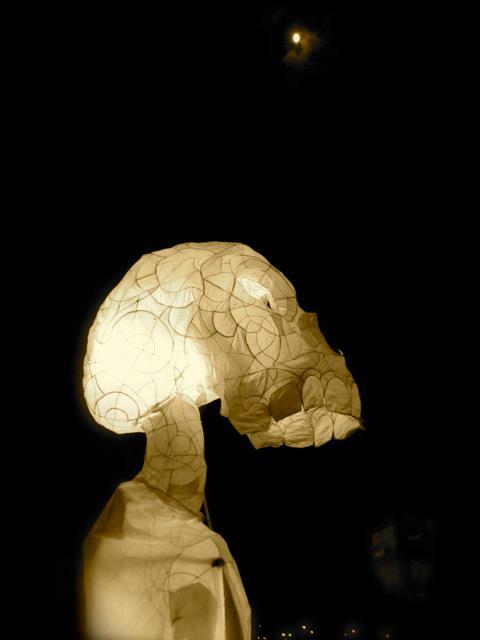 WHAT: Mask, lanterns, floats and help realizing large creative projects for the All Souls Procession. WHERE: 425 W. SIXTH STREET Tucson AZ 85701 WHEN: Every Saturday and Sunday 11AM-5PM, for the month of October. With special clinics announced on the facebook page. HOW: Just show up! 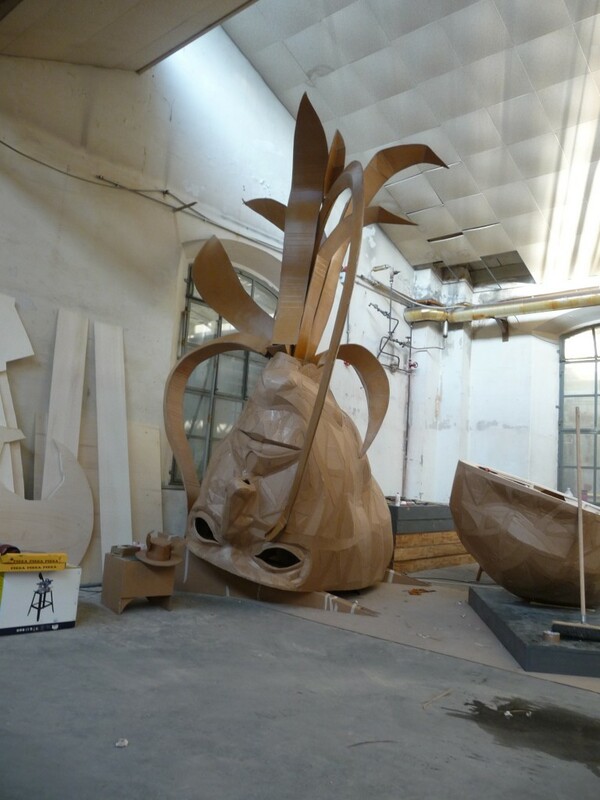 Free to the Public, but please help support the procession and the workshops with a donation. WHO: Lead by Myself and founder of Pork Chop Press Joe Marshal. Facilitated by other local talents. 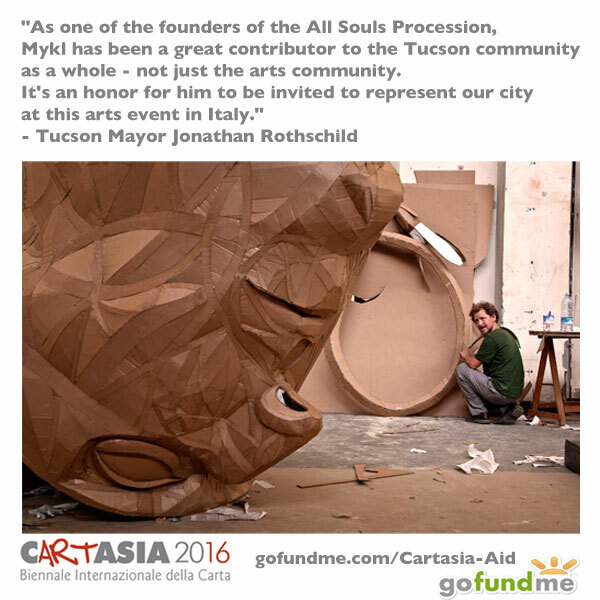 WHY: As co-founder of the All Souls Procession it holds a special place in my heart. I want to see it grow and blossom for many years to come. That won't happen with out community support I feel the best way to get that community support is to support the community. The workshops are non-commercial and free and inclusive. Everybody is welcome. We are here to help you realize your vision for the all souls procession, to make incredible floats, masks, lanterns... you dream it we'll do our best to help it become a reality. 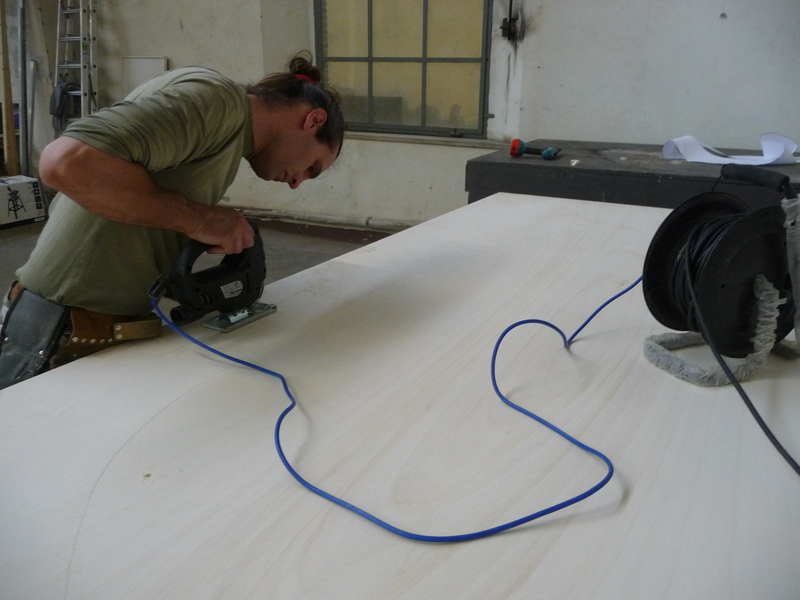 Please consider donating generously to help support the workshops. Below is a special link to Many Mouths One Stomach the organizing non-profit of the procession and our Umbrella organization. By using this link your donation will be earmarked specifically for the All Souls Procession Workshops. Title: Grep. 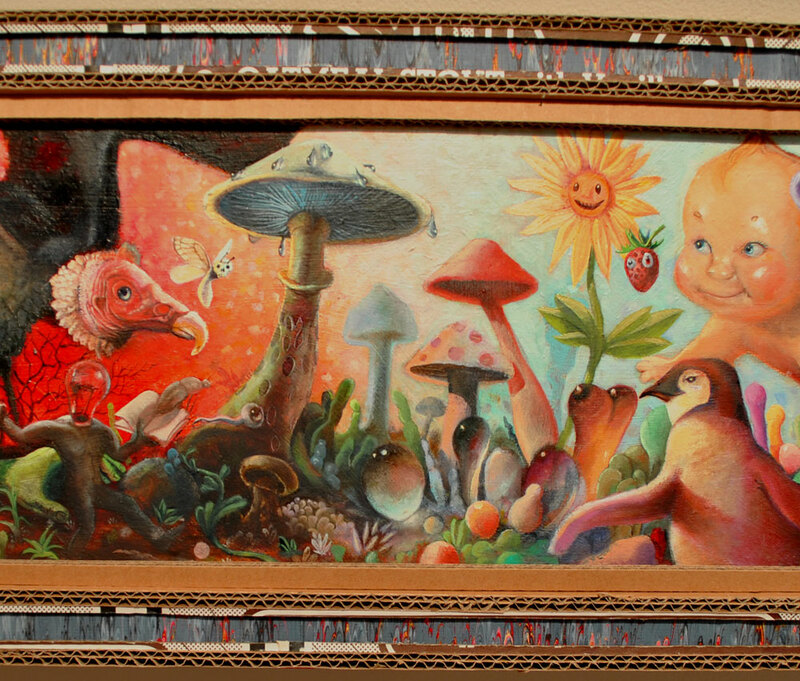 Medium: Oil on Panel, Cardboard Frame Date: 08/30/2012 Dimensions: 18″ X 18.5″ Description: In the age before computers invoking Grep was a perilous action. A little press on the GreenUPGRADDER Blog!